east van baby: Baby's First Halloween! i dont even recall the last time i wore a costume since I entered my 20's (and now 30's). i think it's because i've been working on Halloween (nursing scrubs count? ), it's been raining on Halloween (really, no fun), or that it's been so cold that my sub-par attempt at a halloween costume was hidden under a thick jacket and toque. However, this doesnt mean i dont enjoy this spooky week! 1) Watching AMC Fear Fest (ch. 53) for whatever scary movies are playing. Gone are the days when i can watch movies like The Exorcist, Paranormal Activity, It, or The Hills Have Eyes. i'm officially a scaredy cat! I can tolerate movies though of the cheesy, yet classic variety like Village of the Damned, Halloween, Friday the 13th, etc. nothing that is too close to this decade as the special effects or story lines are just way to real which results in me unable to even go to the bathroom at night let alone function normally when the sun sets. 2) i/we also like going to Parade of Lost Souls around the Commercial Drive area. It's a walking tour that "transforms an East Side Neighbhorhood." Unfortunately, thanks to the torrential rains this last October 27, we weren't able to go this year. 3) Lastly, i like eating the bite size candies! We bought this box of 50 last week and well, we only have 10 remaining- but it's Halloween and we still have some left so if any kids come to the apartment, which i highly doubt, there will be treats for them! I commited to making Max's costume this year and every year until he tells me to stop. What creative idea did i come up with this year you ask? 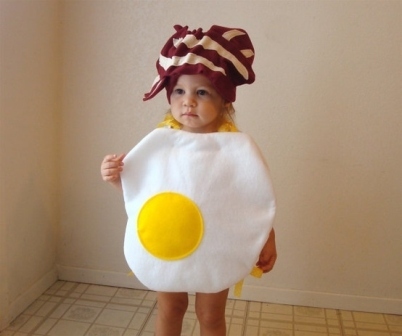 he was going to be a fried egg like this little cutie! Sadly, my costume, was rejected by husband and he put his foot down and said he didnt want him to go as an egg this year so he bought a costume for Max. whatever. There's always next year. and next year he can probably walk, which means trick or treating, which means my egg costume will happen. This year Max is going as Superman. no complaints about it. He looks cute and the costume material is thick (polyester) enough to keep him warm as we venture to the mall for some candy. Of course, the person who rejected my costume isnt even in town to see the one he made me buy! Karma anyone?